The mainstream press has been busy during the past 2 days working itself up into a frenzy of reporting, despite the fact that they are in effect reporting a 4 YEAR old story, something that I have touched on many, many times over the years that LIBOR rates are MANIPULATED by ALL parties concerned as a consequence of a series of credit crisis earth quakes that took place following the collapse of Northern Rock (a year before Lehman's), as fear driven Labour government politicians put pressure on a Panicking and Incompetent Bank of England to loosen the reins on the bankrupting, insolvent banks who took the increasingly nervous nods, winks and nudges as a licence to defraud counter parties to interest rate derivatives contracts (usually other banks). Now four years later the mainstream press is using a magnifying glass on just one aspect of market manipulation that took place during the financial crisis that ultimately will lead all the way to Alistair Darling's and Gordon Brown's Downing Street doors. Today's mainstream press commentary is increasingly concentrating itself on statements that first started emerging in the mainstream press on late Sunday 1st July via Robert Preston of the BBC. 01 Jul 2012 - If Bank of England Approved LIBOR Rate Manipulation, Will Mervyn King Resign? - The real reason for the continuing manipulation of LIBOR was pressure from politicians to avert financial armageddon, probably as of early 2008, and that all roads ultimately lead to the head of the Bank of England, Mervyn King who will likely at some point play his own Ace Card in that he was acting under instructions from Alistair Darling and Gordon Brown even if they never realised the consequences of what they were requesting at the time during a period of extreme crisis. 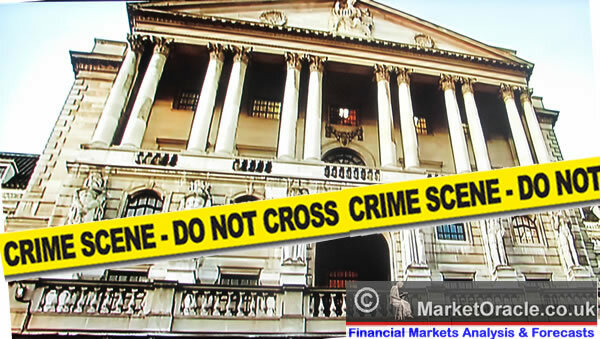 30 Jun 2012 - Bank of England, FSA and Politicians Try to Insulate themselves from Bankster Fraud Fallout - FSA, Politicians and Bank of England were busy putting up smoke and mirrors screens to hide their own culpability in the manipulation of LIBOR. The truth is that politicians get the central bank to print money / debt so that they can buy votes with money they don't have. The central bank induces the banks with cheap money and capital requirements to fund the government deficit by buying government bonds. 28 Jun 2012 - Barclays LIBOR Market Manipulation Fraud To Boost Profits and Mask Insolvency, RBS, HSBC and Lloyds to Follow - That this is an 4 year old story that most market participants have been aware of the fact that the banks were manipulating LIBOR as a consequence of nods and winks from the Bank of England to do so. Barclays Ex-CEO Bob Diamond was liberated yesterday to reveal his version of the truth later today on the degree to which the Bank of England had alledgedly sanctioned manipulation of LIBOR rate submissions to the BBA following pressure from the previous Labour government. Though, I had previously thought (Sunday) that Bob Diamond would use his Get out of Jail Free Card to also keep his job, but the FSA and Bank of England Governor acted to push him to resign so as to reduce the intensity of press focus. He will present his evidence later today at the MP's Treasury Select Committee to include details of phone calls and emails allegedly emanating from right at the top of the Bank of England. Emailed to John Varley on 30/10/2008. Copied to Jerry del Missier. Further to our last call, Mr Tucker reiterated that he had received calls from a number of senior figures within Whitehall to question why Barclays was always toward the top end of the Libor pricing. His response was "you have to pay what you have to pay". I asked if he could relay the reality, that not all banks were providing quotes at the levels that represented real transactions, his response "oh, that would be worse". I explained again our market rate driven policy and that it had recently meant that we appeared in the top quartile and on occasion the top decile of the pricing. Equally I noted that we continued to see others in the market posting rates at levels that were not representative of where they would actually undertake business. This latter point has on occasion pushed us higher than would otherwise appear to be the case. In fact, we are not having to "pay up" for money at all. Mr Tucker stated the levels of calls he was receiving from Whitehall were "senior" and that while he was certain we did not need advice, that it did not always need to be the case that we appeared as high as we have recently. Readers should not forget that Barclays is only the first of many banks to be caught out in rate fixing, and probably the least culpable given the two facts that a. it was the first to settle and b. it was NOT nationalised, i.e. banks that actually did go bust such as HBOS and Lloyds will likely have attempted to manipulate rates to a greater extent. So by all means Barclays is just the beginning of the rate fixing story. Thus the Labour party should be afraid, very afraid, remember how the expenses scandal snowballed during the Summer of 2009, as this has the potential for something similar to occur where we move from bankster's being investigated for what they did and said to regulators and ultimately senior Labour politicians. I will write later this week on the further implications for the Bank of England and its primary purpose which is to print and monetize UK Government debt as the UK continues to stealth default by means of high inflation. Ensure you are subscribed to my always free newsletter to get this analysis in your in box.